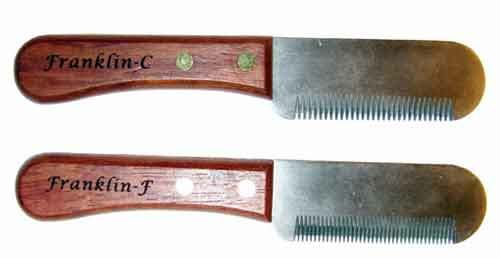 Single blade stripping knives useful for removing undercoat and finish work to help create that “show dog” look. Lightweight; stainless steel blades for extra durability & rust resistance; riveted wooden handles for easier handling, especially when wet. 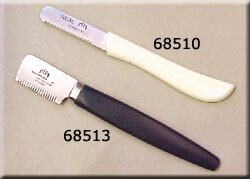 Medium Slant Tooth – Tapered Edge: Thumb side is tapered for more exact work and for tight stripping close to the skin. Coarse Slant Tooth – Tapered Edge: Thumb side is tapered for more exact work and for tight stripping close to the skin. Fine Slant Tooth – Tapered Edge: Thumb side is tapered for more exact work and for tight stripping close to the skin.